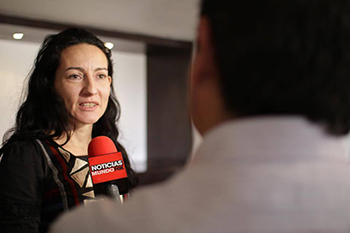 Middlesex University Associate Professor of International Law Dr Elvira Dominguez-Redondo has returned from Mexico having served as one of five independent experts charged with carrying out a human rights visit to the country. In November, the Mission of the International Observers visited Mexico to examine the situation faced by human rights defenders operating there, with the aim of raising awareness about the dangers and threats they encounter and providing the relevant authorities with recommendations on how to safeguard their vital work. During their trip, which was organised by the Mexican Commission for the Defense and Promotion of Human Rights with support from PBI México and Conexx – Europe, the Mission toured the states of Guerrero, Oaxaca, Baja California and the Federal District interviewing human rights defenders, local authorities and European Union representatives. The trip coincided with mass demonstrations following the disappearances of 43 student teachers in Iguala, Guerrero, and the Mission visited the Raúl Isidro Burgos Rural Teachers' College in nearby Ayotzinapa, where they spoke to family members of the disappeared. On the final day of the visit, the Mission presented their initial recommendations in Mexico City, highlighting the vulnerable position of human rights defenders, who often work under threat and attacks from national authorities, transnational corporations undertaking megaprojects and organised crime. Dr Dominguez-Redondo, LLM Programme Leader at Middlesex, said: "Human rights defenders and journalists are essential ingredients of a just and safe society. "They provide visibility on abuses of power and give voice to human rights victims. The vulnerability of such defenders in Mexico is reflection of their strength: the widespread threats and attacks against them emanate from the importance and impact of their work." She added that the Mexican authorities must do more to promote and protect human rights defenders' work by investigating, prosecuting and punishing those responsible for endangering human rights defenders. A final report will be launched at the European Union headquarters in Brussels in May 2015. News about the Mission (mainly in Spanish) can be followed using the hashtag #Hazquesevean on Twitter.